What is the value of expert forensic consultations in criminal defense? From our agency, "For every defendant denied justice, a victim is denied justice." Please tour our website to see how our agency is committed to helping all persons. Seminars and Training: We provide online and on-site training that can be customized to your needs. 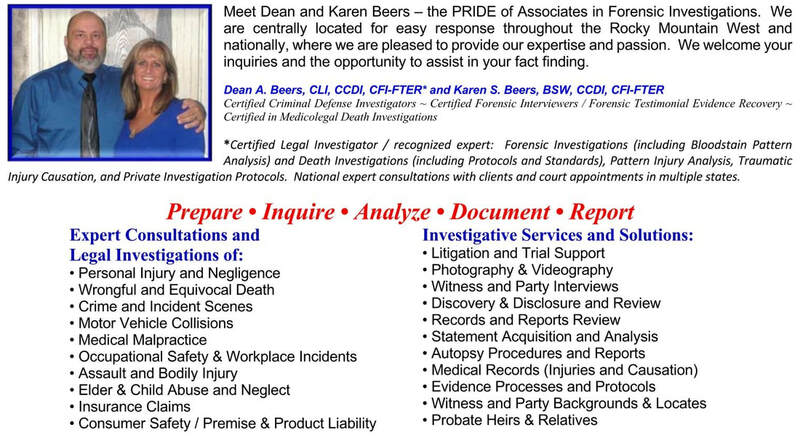 Private investigators, law enforcement, insurance, government, military, public defenders, federal defenders, etc. This includes Legal Investigative Protocols and Death and Injury Causation for Investigators, as well as components of these. We can provide a per-attendee rate or flat rate. Costs are dependent on subject matter, 1-2 days, location and other factors. Cost per attendee averages from $75 (1-day) to $150 (2-day). We will also assist and participate in non-profit association fundraising events.